Baja Designs New 51 OnX (7 Cell) Jeep JK Light Bar Kit. 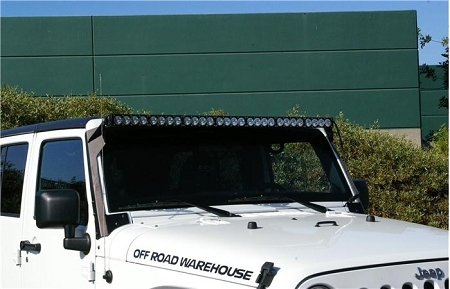 The biggest and brightest OnX LED light bar is now available for easy mounting capability on your Jeep JK. Utilizing our custom designed light bar mount set that will allow you to keep the OEM look on your Jeep and achieve immense functionality from the OnX. Adjustability is easy and with mounts designed to withstand the toughest conditions the OnX will light up the night on any adventure. 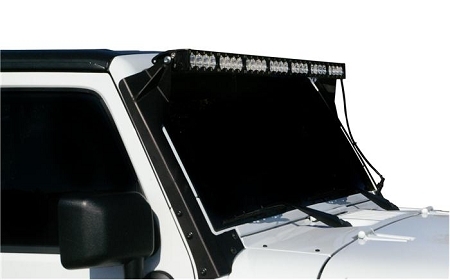 Comparable to running 7 HID lights, yet significantly increases aerodynamics the 51 OnX Light Bar Jeep Jk Kit is perfect for every off road Jeep driver. Hardware, Nylon Shoulder Spacer w/Flange. Used to properly space the bracket away from the Jeeps paint. Hardware, EPDM Rubber Strips w/ Adhesive Backing. Also used for spacing and to protect the customers paint. Hardware, Zip Tye 4 (20-1610). The Jeep JK Light Bar Mount Set has holes along the edge for customers to zip tye there wiring harness to.